"He who ain't with me, is against me." Black Jesus tells the story of Lalubi (Woody Strode), the leader of a Congolese political party, who is imprisoned by foreign armies with interests in his country, thrown in a jail cell, charged with inciting a riot, and eventually executed on trumped up charges. The story is simple and straightforward, told through the eyes of the man as he undergoes his trial and summary execution. The film makes many attempts to establish Lalubi as a Christ figure, and though the constant biblical allusions are heavy-handed at times (as when Lalubi is betrayed by a former follower for 100 pieces of silver), the clumsy symbolism does little to undercut the power of the film. What's important about a movie like Black Jesus goes beyond its technical merits, though the film is handled quite well by the able Valerio Zurlini, delivering a compelling narrative that moves along nicely without sensationalizing violence. Rather, it's important for its status as a cultural artifact. Lalubi's story is based in part on the life of Patrice Lumumba, the man who organized the first political party in the Congo in the 1950s. Lumumba was later captured by the Belgain government for encouraging "riots," though it's more likely he was detained for his political views. After being released, Lumumba became Prime Minister of the Democratic Republic of the Congo, only to have his government overthrown by Colonel Joseph Motubu, who proceeded to run the country into the ground. Lumumba asked for help from the UN but was ignored, as his former relationship with the Russians had given him the stench of a Communist, not a popular choice in the Western world in the 1950s. Black Jesus ably captures the last days of this political rebel, after he has been handed over to the new Congolese regime. Woody Strode gives a command performance as the martyred Lalubi, his quiet dignity under conditions of extreme duress providing yet another parallel to the life of Christ. The religious symbolism is perhaps a bit much, but the message of the film remains vitally important, even today�Western governments have a nasty habit of interfering arbitrarily with the affairs of third world countries and then leaving at the drop of a hat, while the small governments are overthrown by one violent coup after another. While Americans were fighting the "good fight" against Communism in the 1960s, innocent people were being slaughtered every day in countries like the Congo. Had the UN not cast a blind eye towards much of the third world, and had it provided more support for democratic leaders like Lumumba, perhaps the region would be more stable today. But the killing continues (witness the Tutsi/Hutu massacres in Rwanda), and most continue to ignore it. A film like Black Jesus makes doing so a bit more difficult. Image Transfer Review: This is obviously not a big-budgeted or well-preserved film, but the transfer presented here is forgivable, considering the source material Eclectic had to work with. The widescreen image is not anamorphically enhanced, but the loss of vertical resolution isn't really an issue, as the transfer is, overall, quite soft and very grainy. Colors are dull and rather monochromatic, and everything looks quite dark. Shadow detail is poor, with dark-skinned faces blending into the dark backgrounds, and though night scenes feature solid blacks, it is difficult to make out the action. The print used is in only fair condition, showing a number of scratches and lines, but artifacting and aliasing aren't a problem. Audio Transfer Review: This is a fairly rough mono presentation. Dialogue is at least understandable, if muffled at times. Sound effects also come rather muffled, especially considering the ever-present background hiss, but they too are at least presented without too much interference. Again, a good job of handling difficult, aged source materials. 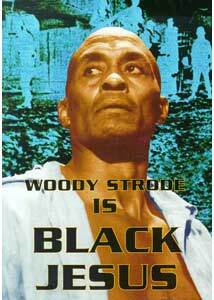 Extras Review: The only extras related to the feature are some brief production notes which helpfully explain a bit of the historical context of the film, and also offer some information about Woody Strode. The rest of the extras are a bit unusual, and relate to Black Jesus in unusual ways. Basie Boogie is an old "music video" of a big band performance of a black musical group. The Little Rascals episode The Kid from Borneo is an offensive-in-retrospect story about the gang interacting with a "jungle man" from Africa. Finally, an episode of Buck Rogers has no connection to the feature that I can discover, but it does offer an opportunity to see where George Lucas got the idea for the communication monitors in The Phantom Menace. An important cultural artifact bolstered by a powerful performance from Woody Strode, Black Jesus is a harrowing, intense picture that manages social commentary despite the heavy-handed religious imagery. The DVD features passable audio and video for such an obscure film, and the extras, though unrelated to the feature, are worth a look.